E-sails (Electric Sails) deflect Solar wind protons to produce thrust, that's good protection for living things in a permanent centre module that produces and stores food and oxygen. I was thinking a fleet of them, looping around Mars and back as far as Venus in a repeating pattern. Every Earth/Mars alignment there is one available for fast as possible travel to Mars another from Mars to Earth. The others at various stages in the cycle. The Venus gravity assist one gets thrown back to Mars for a contingency flyby at Earth/Mars opposition. My question, is the pattern possible with a half dozen of these Oasis transport ships? Although an 'E-sail" can probably protect against some of the protons emitted from the sun, there are far more efficient methods available than a fleet of large sails. For example, by providing each ship with it's own 'E-sail' wouldn't be that hard. 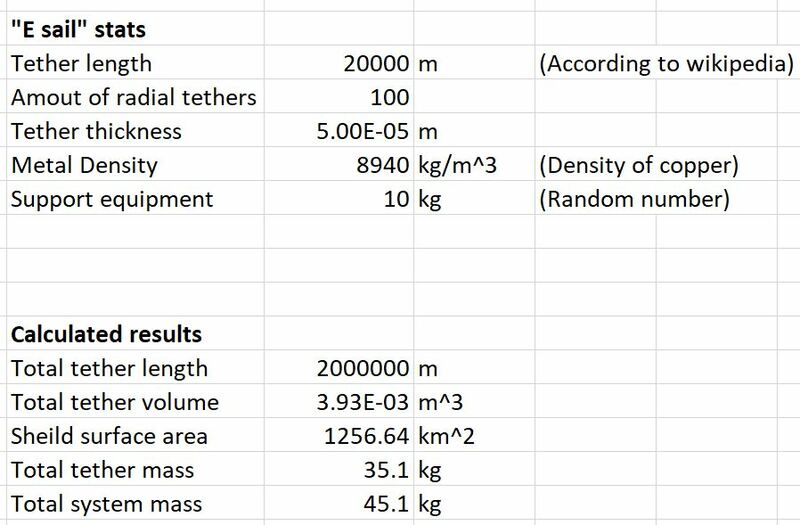 A solar sail system can be extremely light, in this example, the 'sail' part of the system only has a mass of 35 kg for a shield that has an area of over 1000 square kilometers! These are however provided that an 'E-sail' would work as solar wind shielding. Regardless of whether they do or don't, there's more established and practical methods of radiation shielding. Throughout the entire trip [to mars], astronauts must be protected from two sources of radiation. The first comes from the sun, which regularly releases a steady stream of solar particles, as well as occasional larger bursts in the wake of giant explosions, such as solar flares and coronal mass ejections, on the sun. These energetic particles are almost all protons, and, though the sun releases an unfathomably large number of them, the proton energy is low enough that they can almost all be physically shielded by the structure of the spacecraft. Not the answer you're looking for? Browse other questions tagged mars radiation interplanetary solar-sail or ask your own question. How big can solar sails be? Could you protect a crew from space radiation with fuel? Could Solar Cells provide Neutron shielding?